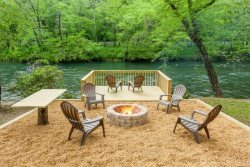 Appalachian Escape provides the perfect place to kick back and enjoy what mountain living is all about. This cozy, rustic cabin is privately situated in a lovely wooded community only 10 minutes from historic downtown Blue Ridge. The large covered porch is a favorite place to hang out with family or friends, enjoying a good meal or just relaxing in the rockers. On the lower deck, you can soak your cares away in the large luxury hot tub. Don't forget to pick up some marshmallows for roasting in the fire pit in the cozy courtyard, complete with an 8' mountain swing and seating for all. Inside, you'll find all the comforts of home including a 42" Flat Screen TV in the Great Room as well as wireless internet. There is a stunning rock, wood burning fireplace sure to take the chill off a cool evening in the North Georgia Mountains. The luxurious leather furniture offers comfort as well as beauty. The downstairs "bunk room" provides a convertible game table of hockey, pool and ping pong. So pack the bags and start making some lifelong memories at Appalachian Escape, the place to be in North Georgia! The cabin is fully furnished and includes a minimum of the following unless otherwise stated. Linens for each bed, 2-bath towels, 1-hand towel, 1-wash cloth per person listed on guest list, dresser or closet for clothing storage, central heat & air, washer/dryer, vacuum and/or broom and dust pan, mop, cable or satellite TV, internet, telephone for local calls and propane gas grill. liquid and laundry detergent for at least 2 loads. Private label Shampoo, Conditioner and Bar Soap. We loved this cabin. It was close to everything and the roads to the cabin were in great shape. Great stay! The cabin was clean and comfortable. We had everything we needed and the location was great and convenient to downtown Blue Ridge. Our stay was wonderful & very peaceful. Mountain Oasis is an OASIS in the sea of cabin rental agencies. They went out of their way and accommodated changes we made and gave us great directions in a friendly and reassuring manner. We previously have rented from another agency but never again after how great we were treated by Mountain Oasis Very pleased and we will rent again with family guests again! Perfect for a weekend getaway It was the perfect space for the price - remote but close to town. The view was good and will be better as the leaves fall off the trees. I would stay here again. From the ease of booking to the detailed information on the cabin and how to access the cabin, our experience with Mountain Oasis Cabin Rentals and specifically our rental "Appalachian Escape" was amazing. The cabin was incredibly comfortable and was exactly as described. The views and amenities kept my family constantly entertained and the property was also very pet friendly. The location also could not be beat as we were literally within 10 min to a Food Lion, a Walmart, a gas station and downtown Blue Ridge. We would happily stay here again and will definately book through this company again.